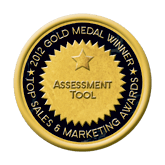 We use the world’s # 1 sales team evaluation tools from Objective Management Group, which have been used to evaluate over 1 million sales professionals over a 20 year period. These resources have helped 10,000 companies identify areas for improvement with their sales teams. These tools uncover the real reason preventing companies from experiencing record-setting sales growth, and lay a foundation for understanding what needs to change. Often the sales professional is unaware of the weaknesses holding him or her back. By evaluating the sales team, system and processes, we can pinpoint exactly where improvement is needed. We can even identify what the increase in revenue will be if the issues are addressed. At Braveheart Sales Performance we feel it is only logical that we first diagnose the situation, by completing an evaluation of the sales team, before being able to prescribe a cure.